If you're looking for fishing, whale watching, sun and coastal fun, look no further than Bay Echo! Set in downtown Depoe Bay, this condo features a modern interior coupled with gorgeous views and an ideal location, all at a great price. Located on the accessible first floor, the kitchen offers granite countertops, dark hardwood cabinetry and stainless steel appliances. Right next to the open kitchen is the living room with incredible views of the Pacific Ocean and access to a private deck. Owners and guests have sighted whales from the deck or living room at only 100 yards away, even in the off-season. 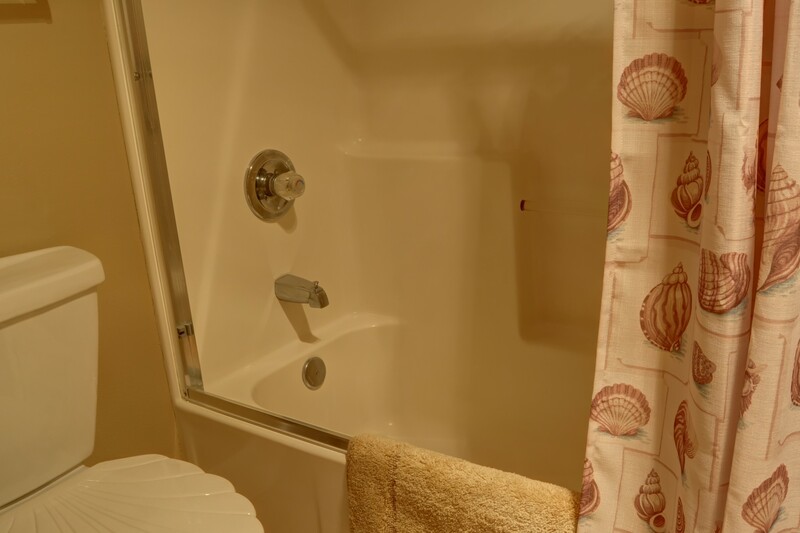 Two bedrooms and a large full bathroom are located on the first floor. 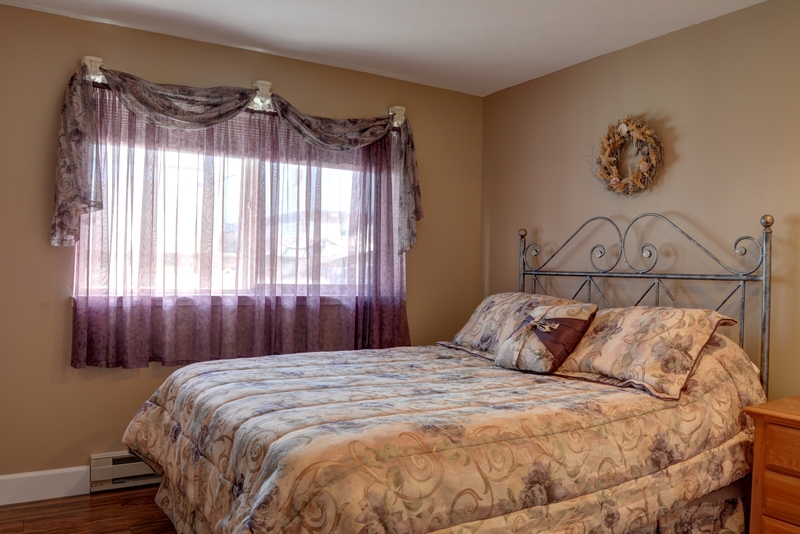 The master bedroom offers a king bed, and the second bedroom offers a queen bed. The second floor of this home is a large loft with a full-twin bunk bed and separate twin bed that make for the perfect children's retreat. Bay Echo is located within a few minutes walking distance to dozens of shops and restaurants. Below the condo are storefronts right off of Highway 101 where you can go souvenir shopping, and great food can be found in eateries such as Thai Bay View Kitchen and Mazatlan to the south and Tidal Raves and Tide Pool Pub to the north, all just a few blocks away. The world's smallest harbor in Depoe Bay also offers you some unique experiences on fair weather days- whale-watching and deep-sea fishing! In addition to these activities, Depoe Bay is centrally located between Newport and Lincoln City, both of which are major coastal cities with a plethora of things to do. Just over two hours from either Portland or Eugene, experience Depoe Bay from this luxurious condo today, and enjoy all that the Oregon Coast has to offer! "Beautiful condo we plan to return to every chance we get"
"Hello Diane, Thank you for your review. We are glad to hear that you had a great stay at Bay Echo! We look forward to having you stay with us again soon!" "This place has it all! The condo is stocked with anything and everything! We stayed 9 days total. We were scheduled to leave after 7 days but we loved it so much we added a couple days. The view can't be beat. The shops are directly under you. I brought my Mom and her hubby with my 3 year old. Mom had never seen the ocean before. All three of us are disabled but this location made it easy to see and do a lot, not always the case. I cant give a higher rating but we hope to come back here! " Another fantastic MOL(Mean Old Ladies) vacation! "Echo Bay has become our yearly fall get away. The location is wonderful, easy access to everything, great restaurants in walking distance, beautiful accommodations and super friendly, helpful staff. " "Hello Royce, Thank you for your review. We are so happy to see that you loved yet another stay at Bay Echo! We hope to see you back again for another great trip on the Oregon coast. Thank you again for your review!" "Hello Tricia, Thank you for your review. We are so happy to see that you loved your stay at Bay Echo! We hope this means we'll be seeing you back again soon on the Oregon coast for another great vacation!" "We always have a wonderful time at Bay Echo. The view is beautiful rain or shine. Well stocked kitchen. I can cook just about anything. It is clean and well appointed. If we cant run around outside because of the weather, we can stay inside and enjoy the condo. There was not a good supply of toilet paper. Corners in the bathroom need attention and cobwebs in kitchen. Our contact with the management committee any was pleasant and helpful !" "Hello Donald, Thank you for your review. We are glad that you enjoyed your stay at Bay Echo. Each of our homes is supplied with a starter pack of supplies, which isn't meant to last the entire trip unfortunately. We are working on getting this added to our check out process so that future guests know to bring extra supplies, especially for longer stays. Because we are not a hotel, we are not able to come by each home with extra supplies every day. We are sorry for any inconvenience this may have caused. As for the extra needed attention, we will pass this information on to our housekeepers. We are always striving to provide our guests with clean units. We are happy to hear that you had a pleasant communication with our staff and that they were helpful. We hope to see you again soon on the Oregon coast, and thank you again for your review!" "Hello Donald, Thank you for your review. We are glad to hear that you enjoyed another stay at Bay Echo. It sounds like this home has everything you could want for a vacation on the Oregon coast. We are glad to know that our staff is always helpful and accommodating as well. We hope to have you continue staying with us at Bay Echo. Thank you again for your review." "Very nice time. Condon was nice." "Hello Bret, Thank you for your review. We are glad to hear that you enjoyed your stay at Bay Echo! We hope this means you'll be back again soon for another great stay on the Oregon coast!" "The rental was great! Clean, perfect location and couldn't be more on target in Depoe Bay. " "Hello Brian, Thank you for your review. We are happy to see that you enjoyed your stay at Bay Echo and to know that the rental was clean during your stay! We always strive to maintain the best rental conditions in our units. We hope to see you back again soon on the Oregon coast." "Have stayed at Bay Echo three times now and will continue to make it a priority every year. It is exactly as advertised and always clean and well appointed. Incredible location, ocean views, whale watching and shops and restaurants in walking distance. Highly recommend Gracies Sea Hag, The Horn and Tidal Raves for wonderful meals and beverages. The staff is cheerful, and always willing to help out whatever your needs may be. We will continue to take our fall trip to Depoe and Bay Echo and have recommended it to family and friends. " "Hello Royce, Thank you for your review. We are so happy to hear that you enjoyed yet another visit to Bay Echo! We are thankful to have a wonderful customer such as yourself. We look forward to seeing you again next Fall!" "If you like watching whales in the harbor, delighting in sunsets, sitting on the high white chairs on the porch to survey the horizon, a beautiful kitchen with everything you need, comfy beds, immediate proximity to the shops in Depoe Bay, and peaceful quiet in the house and on the porch, you have found it here. A fabulous find. Thank you, owners, for sharing." "Hello Rosemary, Thank you for your review. We are so happy to see that you enjoyed your stay at Bay Echo. We hope to see you back again soon for another wonderful vacation on the Oregon coast." "This unit is in downtown Depoe Bay, making it very convenient to walk to the stores and out for a meal. We could watch for whales from the balcony overlooking Hwy 101 and the ocean. In the dining area there is a smallish, tall round table with 4 tall stools. Adjacent to the table is the kitchen counter with four stools. If your group has more than 4 people and sitting everyone down to a meal at one table is important to you, don't come here.To get cooler air in the unit in the evening, we left the door open to the balcony. Some Hwy 101 street noise was noticed by those who slept upstairs, but they put in ear plugs and were able to sleep. I didn't notice the street noise in the back two bedrooms. In the living room there is comfortable seating where our 6 adults could gather, relax, talk...and watch the World Cup. All rental arrangements were made on line and all customer service communication was done by email." "Hello Susan, Thank you for your review. We are glad to hear that you and your group had a great stay at Bay Echo! It sounds like this rental was pretty perfect for the most part! We hope to have you stay with us again soon on the Oregon coast. Thank you again for your review." "The inside of the condo is beautiful. We felt right at home the entire stay. The views through the kitchen and living room were gorgeous. We were able to whale watch every single day, from morning to evening. " "Hello Dora, Thank you for your review. We are happy to see that you enjoyed your stay at Bay Echo. We hope to see you back again soon sometime in the near future!" "The condo has an AMAZING view!! We watched the stormy waves from the window and the waves were so high they actually hit the window!!! So fun to watch people who didn’t know better, run from the spray!!! The condo was very clean and lovely. Looks newly painted. And, a new fridge! Love it💖"
"Hello Donald, Thank you for your review. We are happy to hear that you enjoyed your stay at Bay Echo. It sounds like you had a great time watching the beach and the people walking around. We are glad that you found the unit to be satisfactory. We hope to have you stay with us again in the future." "Hello Donald, Thank you for your review. We are happy to see that you enjoyed your stay at Bay Echo yet another time! We hope this means we'll be seeing you many more times in the future! Thank you again for your review, and we can't wait to have you back!" "The house was clean with everything we needed. Fantastic location. Couldn't have asked for anything better. " "Leigh, thank you for your review in regards to your stay to Bay Echo. We are quite pleased to hear you enjoyed your visit and the home met your expectations. We hope memories were made that you are able to share with friends and family alike for years to come. Should you decide to visit the beautiful Oregon Coast once again we would enjoy hearing from you to assist in the planning your getaway. Again, Leigh thank you! " "The Seaquell and Bay Echo condos made a great vacation spot for our extended family from across the country. Comfy rooms and beds with an awesome ocean view. Whale watching from almost anywhere in the house and people watching from the patio, something for everyone. " "Hello Sharon, Thank you for your review. We are glad to hear that you had an amazing visit to Bay Echo. It sounds like you and your family had a wonderful time together on the Oregon coast. We hope they can make it out again in the near future!" "The rental was exactly as we remembered as it was the second time we had rented it. Clean, great location and watching the whales from our balcony. " "Hello Brian, Thank you for your review. We are glad to hear that you enjoyed your stay at Bay Echo. We are so happy that you had yet another wonderful stay at this rental. We hope to see you again!" "Excellent location -- we saw whales every day from the bay windows and balcony. Right above the shops, so fun for people watching, too. Kick back and have a beer while your wife shops! It never felt like we were in the "middle of it all" yet we were. Easy walking to the shops and numerous restaurants. We were there for a week and there were several days the car never moved. Condo was excellent. Well appointed and spotless. Everything from the WiFi to the toaster worked great. Zero regrets -- would rent Bay Echo again." "Hello Robert, Thank you for your review. We are happy to see that you enjoyed your stay at Bay Echo! We can't wait to see you back again soon in the future!" "This condo was exactly as the pictures. It was clean, completely stocked and ready for our group. I was very pleased with this condo and will recommend this property and stay here again. Thanks for a great weekend!" "Hello Paula, Thank you for your review. We are happy to see that you enjoyed your stay at Bay Echo! We can't wait to host you again soon on the Oregon coast." "Bay Echo, accommodated our group of 8 comfortably in this property. Liked the ambience, access to ocean and cleanliness. Property stayed closer to the ocean with great sunset ocean views. It was our last minute rushed pick during peak season but pleasantly surprised with Bay Echo." "Hello Sriramkumar, Thank you for your review. We are happy to hear that you enjoyed your stay at this last minute rental you booked! Bay Echo is a lovely condo that truly offers it all! We hope to see you back again soon on the Oregon coast. Thank you again for your review." "Nice, clean, quiet and beautiful view of the ocean! We could hear the whales at night on the patio whic was so cool! " "Hello Heather, Thank you for your review. We are glad to hear that you enjoyed your stay at Bay Echo. We are happy that you were able to get a real feel of the coast while staying here! We hope to have you stay with us again soon!"